Contact us – El Paso Education Initiative, Inc.
From I-10 West: Take Exit 9 (Redd Rd). At Redd Road, turn right. At Resler Drive, turn right. At Bishop Flores Drive, turn right. Howard Burnham Elementary will be on your left. From I-10 East: Take Exit 9 (Redd Rd). At Redd Road, turn left. At Resler Drive, turn right. At Bishop Flores Drive, turn right. 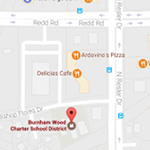 Howard Burnham Elementary will be on your left. From Loop 375 (Joe Battle) North: Take Exit 40 (FM 659, Montwood Dr/Zaragoza Rd). At Montwood Drive, use the crossover to get to Joe Battle south. Turn right on Lorenzo Ruiz Avenue. 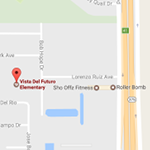 At Bob Hope Drive, Vista del Futuro will be in front of you. From Loop 375 (Joe Battle) South: Take Exit 40 (FM 659, Zaragoza Rd/Montwood Dr). Go straight at the intersections of Zaragoza Road and Montwood Drive. Turn right on Lorenzo Ruiz Avenue. At Bob Hope Drive, Vista del Futuro will be in front of you. From I-10 West: Take Exit 9 (Redd Rd). At Redd Road, turn right. At Southwestern Drive, turn right. At Crusade Drive, Da Vinci will be on your right. From I-10 East: Take Exit 9 (Redd Rd). At Redd Road, turn left. At Southwestern Drive, turn right. 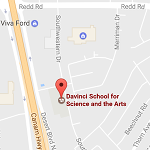 At Crusade Drive, Da Vinci will be on your right.